Though irregularity in the heartbeat is a potentially alarming symptom, many women experience it without even noticing it. In fact, around 20% of adults experience a flutter or another irregularity within a given 24-hour period. However, because the occurrence of it can be so disconcerting, many women may wish to seek treatment for their peace of mind. Luckily, an irregular heartbeat during menopause is often a sign of hormonal imbalance, not a life-threatening condition. Given that estrogen plays a role in regulating the nervous system, the hormone's fluctuations during the menopausal transition can result in occasional irregularities in heartbeat. Keep reading to find out more about the various treatment methods available. When addressing an irregular heartbeat, there are three approaches to take into consideration. These are categorized as: (1) Lifestyle Changes, (2) Alternative Medicine, and (3) Medications and Surgery. Generally, it is advised to start off with lifestyle changes, the least risky form of treatment. If the first two approaches prove unhelpful, medications can be turned to as a last resort. The first approach to treatment involves the lowest level of risk, but it takes the most self-discipline and determination. For most women, simple lifestyle adjustments can reduce incidences of irregular heartbeat while at the same improving overall health. The first step in making lifestyle changes is eating a well-balanced diet. For heart health, it is essential to reduce cholesterol and eat lots of fruits and vegetables. Omega-3 fatty acids can help bring down cholesterol levels and also benefit overall health. In addition, estrogen-boosting foods like soy and peas can help compensate for a hormonal deficiency. It is also important to avoid products that are high in trans fat, such as lard and greasy foods. Regular exercise is also beneficial, but care must be taken. Since aerobic exercise can trigger heartbeat irregularities, it is better to start with exercises like walking, yoga, and Pilates. Not only can these relieve stress and anxiety, but they can improve blood flow and lower cholesterol, just like any form of exercise. 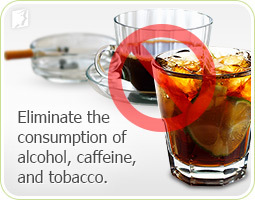 In addition, it is crucial to avoid certain habits that could trigger or worsen heart problems. Since alcohol, caffeine, and tobacco directly affect the nervous system, they could cause heart flutters and other irregularities. It is best to completely eliminate the consumption of these substances while symptoms persist. Lifestyle changes are a wholesome way to manage an irregular heartbeat, but they can be difficult to get in the habit of doing. Also, not all changes treat the symptom at its source - hormonal imbalance. However, alternative medicines are a safe and effective way to balance hormones and, in turn, get an irregular heartbeat under control. Continue reading to learn more about natural treatments for heartbeat problems. The alternative approach consists of several possible treatment methods. For example, massage and deep breathing techniques can relieve stress and improve circulation. However, herbal supplements are thought to be the most efficient treatment, since they are easier to keep up with and require less time and money than other alternatives. In addition, they are the only alternative method that can address the root of most cases of irregular heartbeat during menopause: hormonal imbalance. In terms of herbal supplements, there are two main types that work to balance hormones: (1) phytoestrogenic and (2) hormone-regulating supplements. These supplements are a source of phytoestrogens, plant-based nutrients that function like estrogen in the human body. They can counteract an estrogen deficiency, but because the body can eventually become less capable of producing natural hormones, the long-term use of phytoestrogens is generally not recommended. Taking this kind of supplement for a prolonged period could ultimately result in lower levels of estrogen. These supplements balance hormone levels by nourishing the hormone glands rather than by adding outside hormones to the body. This benefits not only estrogen, but also other hormones that decline during menopause. Since these supplements promote natural hormone production, they are considered to be both effective as well as safe for use for any duration. A combination of approaches - particularly lifestyle adjustments along with herbal supplements - is often enough to treat an irregular heartbeat. However, in more severe cases, or when another underlying disorder is the cause, medical intervention may be necessary. However, the risks and benefits should be fully assessed before jumping to this option. The third level of treatment entails the highest risk and frequently the highest costs. In recent years, the most common medication prescribed for menopause symptoms - including an irregular heartbeat - has been hormone replacement therapy or HRT. However, its connection with adverse side effects and increased cancer risks has caused healthcare professionals to reconsider this extreme option. Other heart-regulating medications may be prescribed, but they are reserved for extreme cases where irregular heartbeat poses a health threat. These medications, called anti-arrhythmia drugs, either help prevent heartbeat irregular heartbeats from happening again or keep heart rate from getting too fast or too slow. In other life-threatening situations, defibrillation or surgery may be called for, but these cases are rare. However, when an irregular heartbeat is caused by hormonal imbalance, such medications are not necessary and often carry more risk than benefit. Before starting any medical treatment plan, it is imperative to first consult a doctor for guidance. The three approaches detailed above can be combined and used as necessary to manage heart problems. More and more women are finding that a combination of lifestyle changes and alternative medicine is the most effective means of treating an irregular heartbeat during menopause. Read more about Macafem and how it works. 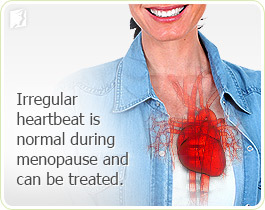 Women going through menopause sometimes experience irregular and rapid heartbeats as a result of changing hormone levels. Although usually harmless, arrhythmia can be a sign of a more serious problem. This is why it is important to relieve any discomfort arrhythmia causes and to also address underlying triggers for arrhythmia. Click here for more.